Swedish reader LN has translated and summarized some material about Tariq Ramadan for Gates of Vienna. Last week all Swedish politicians of any weight, their supporters and partisans, lobbyists, and also ordinary people met up at Almedalen in the town of Visby on the Baltic island of Gotland. This has been a growing tradition since 1968, when the custom was introduced by the socialist Olof Palme (at that time Minister of Education) giving an improvised speech to a few believers from a lorry platform. Last week was filled with speeches, discussions, meetings, concerts and musical performances (bread and circuses for the people), and other opinion-forming events. The complete Social Democratic Workers Party (SSP) was there, also representatives for the Workers Union (LO), the leaders of the non-Socialist Parties, the Prime Minister himself (a.k.a. HSB = he who decides), Göran Persson, the minister of finance Pär Nuder, etc. Others present: from the French parliament Ségolène Royal, a socialist; Helena Benouda, a convert, from the Swedish Muslim Council; and last, but not least, Tariq Ramadan, professor. An intense election campaign is in progress — the Parliamentary election is in September — and the Socialists are anxious to solicit Muslim voters — up to 400,000 votes might be at stake. Tariq Ramadan was introduced by Peter Weiderud (chairman for the Brotherhood Movement, former Secretary General of the Conference of European Churches) simply as a “scholar and professor” from London. During the week in Almedalen a few collaborators of the liberal-conservative think tank ‘Timbro’ were reporting. One of these was present at the Tariq Ramadan speech and tried to pick up as much of it as possible; the results can be read here (or see below). Is there anything the Swedish Social Democrats will not permit themselves to do in order to win votes? 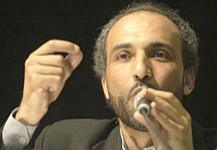 Tariq Ramadan: It’s important for westerners to listen to the discourse within the mainstream Muslim community. Muslims aren’t the only ones who have to reevaluate their perceptions. There is a new Muslim presence, a new Muslim visibility. Third-, fourth- and fifth-generation Muslims are beginning to question who they are and what the future holds for them. We [Muslims] are far behind the realities of our societies. The European societies are changing and we have to take this into account. Ignorance, suspicion and mistrust: People in Europe wrongly assume that Muslims are here to “Islamify” their new home countries. Muslims, on the other hand, tend to nurture a victim mentality. This creates a climate of mistrust. There must be a “revolution of trust,” and we must move away from an “evolution of fear.” Islam is complex… don’t oversimplify it. The anti-Muslim discourse traditionally reserved for far-right political parties is now being co-opted by Europe’s mainstream parties. What does the religious integration mean? Muslims have been minorities for a very long time, not least in Africa. But it is new for Muslims to be minorities in secular societies. People are confusing social problems with religious problems. The riots in the French suburbs were not about religion, but rather social and economic injustice. The religious integration is, in fact, complete. I am Swiss by nationality, Muslim by religion, Egyptian by memory, and internationalist by principle. People ask “who are you?” in order to define what they are not. They want to pigeonhole you. When one contributes to a society, one’s nationality is never questioned. The majority of Muslims deplore extremism. Islam condones neither arranged marriage nor violence against women. People want Muslims to communicate values that dovetail with their own values. This makes them feel better about themselves… reaffirms their belief systems. The Muslim presence in Europe is a test…a positive test. Our presence forces you to ask questions about yourself. Every country has its assets and liabilities. Important to ask: What are our values? What is the gap between what you say and what you do? Are you practicing what you preach? One cannot compare one country to another. Sure you can compare Sweden to a dictatorship and feel like you’ve won…but it’s not a real contest. You need to compare Sweden to Sweden. We need to sow the seeds for the “revolution of trust” at the local level…we need to create trust at the local level. This will help to create the conditions for a new “We.” Let everyone come together, with Swedish common values as the foundation, to create a new identity. We much teach more inclusiveness in our schools. European silence is the cause of violence in suppressed societies, such as we are seeing in the Palestinian territories. Peter Weiderud: Are European societies afraid of religion? Tariq Ramadan: Yes, but people also misunderstand what secular means. Secularism is used a weapon against religion. We need to embrace pluralism. Secularism should create room for all faiths in society. We have to get back to the roots of secularism. PW: Is there a secular fundamentalism? TR: Yes, in France we are dealing with many secular fundamentalists. Two years ago the French government amended the law, making it incompatible with the Muslim presence. Many French people have a very narrow interpretation of secularism. PW: What is the situation for Muslims in Sweden? Helena Benaouda: Islamophobia is the gravest form of discrimination in Europe. The headscarf is a big issue in Sweden, of course. And it creates barriers, especially in the labor market. PW: How can we nurture the internal dialog in the Muslim community? TR: The Islamic creed and practices are the same wherever you go. The core values are identical. But there are different interpretations of Islam. And there is not merely the moderate and the radical. This perception is ignorant. There is a great expanse of interpretations under the banner of Islam. We need platforms where these various groups can come together and dialog. Publik: How will Turkey’s joining the EU affect Islam? TR: We have to agree on the parameters. Religion is not the question. We have to speak about laws and values. It boils down to principals, not religion. Islam is now perceived as a threat. The Turks are afraid that integrating with the EU will dilute their identity. They are living as Muslims and democrats. But Europe must respect their religion and traditions. Senegal is an Islamic country, for instance, yet it is also a democracy. Publik: You talk of mistrust and suspicion. What role do the Islamic countries in the Middle East play? TR: Everything happening in Islamic countries is not black and white. In the Palestinian case, for example, one can understand a situation without justifying it. The Americans revoked my visa and said that to understand is to justify. You can understand why the Palestinians do what they do, but I don’t justify it. Let’s understand the roots of extremism. The Muslim presence in Europe must condemn extremism, but also explain why it is there. I have to condemn hudud, for instance, because it is wrong. We can’t be silent; it’s a question of moral dignity. Billy McCormac: Can you compare Muslim integration in the United States and Europe? Has one succeeded better than the other? TR: There are some major differences to consider here. The Muslims who immigrate to the United States are primarily well-educated professionals, who by virtue of their background find it easier to assimilate into the American society. The Muslims who immigrate to Europe are of far more modest means. The acceptance of the American community has helped to remove tensions. At the same time, Muslims remain far removed from the corridors of power. A far more suitable comparison with European Muslims is the African American Muslims. Here you have people living in ghettos, on the margins of society. They have no voice, no power. Whereas many Middle Eastern Muslims have become seamlessly integrated into American society, the black Muslims languish on the sidelines of society, much like their brethren in Europe. "A far more suitable comparison with European Muslims is the African American Muslims. Here you have people living in ghettos, on the margins of society. They have no voice, no power. Whereas many Middle Eastern Muslims have become seamlessly integrated into American society, the black Muslims languish on the sidelines of society, much like their brethren in Europe." Speaking here as an African-American, I can attest to the reason why black Muslims languish on the sidelines of society: most of them have as their leader one Louis Farrakhan a virulent anti-semite, perennial race baiter, grievance mongering opportunist, and professional apologist for urban black pathologies. On the positive side, he's a pretty decent violinist. If European muslims are being lead by men of a similar ilk, then that would explain why they are on the margins of European society. It would also explain why, just like my misguided black brothers and sisters in the US who follow Farrakhan, they deserve to remain right there on the margins until the errors of their ways is made clear to them. Golly, Starling, I didn't know ol' Louie played the violin. Excellent viewpoint, from the inside, shall we say? Islam condones neither arranged marriage nor violence against women. No violence against women? Now, why do I have another impression? Good short description of Louis...but you left out his genetic expertise on the origins of the white race and his inspirational visits to the orbiting mothership. re Tariq Ramadan's visit to Sweden, one word kept resonating thru my mind as I read the post, taqiyya. ...most of them have as their leader one Louis Farrakhan a virulent anti-semite, perennial race baiter, grievance mongering opportunist, and professional apologist for urban black pathologies. Actuallly, a tiny fraction of black American Muslims belong to the Nation of Islam. As I understand it the son of Elijah Muhammad became an orthodox Sunni Muslim, and his group is the biggest by far. I also suspect that Tariq Ramadan is on this question a fool. I know of no evidence that black American Muslims are "living in ghettos, on the margins of society, [with] no voice, no power." I wonder what Ramadan has to say about shari'a and dhimmi in the Middle East if he considers Islamophobia in Europe such a grave threat. Turkey is the only muslim country which has an independent democracy. It has achieved this through the aggressive use of secularisation, including banning of hijab for civil servants. All countries where Islam is respected as a pillar of the state are brutal dictatorships or under occupation by Western powers - apparently this is the furture TR strives for. "The Islamic creed and practices are the same wherever you go. The core values are identical. But there are different interpretations of Islam." Excuse me emperor, I don't believe you're wearing any clothes. If the creed, values, and practices of Islam are identical throughout the world, what room is left for interpretation? Allow me to demonstrate: if Allah is one, as I've been lead to believe that all Muslims believe, then he cannot be, say, three. Moreover, this idea cannot be reinterpreted as saying that by one, Mohammed really implied three. So Tariq, you are left with few alternatives to rationalize your stunning illogic: The Islamic creed, values, and practices are not uniform throughout the Muslim world; Certain ideas, though called Islamic, are not really Islamic that clash with your brand of Islam, or some other if you prefer; OR Creeds, values, and practices that clash with Islam are not really creeds, values, and practices at all because only Islamic values can be described as such. In short, you cannot, by definition, interpret an idea differently which everyone agrees upon, because once you do, everyone ceases to agree upon it. you are right. Most black Americans that are Muslim do not belong to the Nation. When I was a kid this was the case... that's why they referred to as "the Black Muslims"- there really weren't any others to speak of. This is no longer the case. I assumed TR was talking about the Nation of Islam because if he wasn't then he had his facts all wrong. Islamophobia is the gravest form of discrimination in Europe. He's smooth and convincing when he lies. You have to admit he'll trick many of the people who listen, but only those who are unwilling or unable to read primary Islamic sources and critically analyze the content. Islam is a vehicle for Arab imperialism and Islamic supremacy, but "Islamophobia" (great buzzword, no actual meaning) is the biggest problem. Never mind the enormous upsurge in Jew-hatred and European self-loathing. Convert, submit, or die. Ramadan is an expert at creating submission and encouraging conversion. He's a wonderful second and third punch after the bombs begin to go off. "The anti-Muslim discourse traditionally reserved for far-right political parties is now being co-opted by Europe’s mainstream parties." .. and I think this is good news. I think after reading this I can say that Ramadan is a well-spoken liar. He cleans up real nice, but under the suit and tie he is just an opportunist for Islam.